Happy Sorce–er, Shadow Weav–no, Fearless Phot…Voltro…uh, Fisto Day? Hell of a sale today…along with all the new MOTUC stuff, there’s also Red Lion & Lance, a re-release of the awesome Blazing Sword Voltron SDCC exclusive (which I really need to review one of these days), plus a bunch of other reissues and re-releases. The sale is at 12pm ET as usual–here’s the all-in-one page. Club Eternia Members, we’ve just confirmed a small portion of our shipment of Shadow Weaver and Fisto is running a little behind. Most Club Eternia orders will start shipping on Monday 2/13 as planned, but there will be some orders that will ship around 2/17. All other products will ship as usual, including Voltron Red Lion/Lance and the Essential items. On January 19, 2012, Scott Neitlich wrote: “We also changed our policy so that we will not sell a figure until it is 100% in stock.” Noted without comment. I haven’t been charged for my 30th Anniversary sub yet, and evidently neither has anyone else. I’m not going to complain about MOTUC or Mattel, but man do I hate Digital River. I haven't been charged for my sub either. Strange. I wish there was an easier way of doing this, but I want my toys. Oh, to have the days again where I could wander into Caldor's or Bradlees and just fill the cart up with plastic goodness. Very painless for me today. Right at when the clock ticked 12 I was able to put my Fisto in the cart and check out before 12:01, and immediately received my confirmation email. Best experience with matty collector yet. Wow. That was relatively painless. 3 minutes, in and out. Almost as quick as prom night. I had no wait screens either. Quick and painless. Mmmm, Shadow Weaver's form-fitting robes. Mmmm. Isn't she kind of the definition of "butterface"? I've been following MOTUC since the beginning, but never got into collecting until yesterday. So all things considered, today was pretty easy compared to what I've heard. I grabbed all five of the figures listed for sale today. Maybe next year I'll finally do the sub. So Fisto is already gone and Sorceress is almost gone. Thanks for the lower production numbers Mattel, but I guess this is how they rate their success is just how quickly they can infuriate fans. I just started a job a month ago that allows me to be online to buy these figures, I feel for everyone who now has to go to ebay (or just wait for them to show up on amazon). Also the Sub-items on the cart scare doesn't help much… I'm not a subscriber and I had 2 subs in my cart… with 3 Fistos and Sorceress 2 Weavers and 2 Star Sisters second payment… Not cool. Had to delete a lot of stuff before ordering. At least I got Fisto and Sorceress. Poe, I received an email at 1257am that Photog shipped to me – however, my CC did not get charged until after they shipped, apparently. I did get an email for the regular sub renewal including Sorceress, SW and Fisto, but no shipping confirmation yet – for obvious reasons, per your post above. I got through with the usual few minutes of WSOD but got what I wanted (1 Sorceress, 1 Fisto, 2 Beastman and 2 Stratos). I am a bit concerned about my subs not renewing though. I received my Voltron Red Lion and Lance yesterday but I didn't get any shipping notice or see a charge on my card (which would have been declined as my card had to be cancelled due to fraud) I think I'll be braving the DR customer service line at lunch today to see what's up. I'm extremely tempted by Photog but also a poor college student… How can I justify this purchase? I'm not sure if the big changes in ordering that Scott promised have already taken effect, but….damn. I didnt even log on until 15 minutes into the sale (I forgot), grabbed fisto, got to the checkout, decided to go back and add panthor, checked out and, boom, done. In and out in three minutes without a single wosd. I am very pleased. The only sub I have is the voltron. I got my shipping notice today, but still haven't gotten charged. As long as they don't overcharge me, Im good. Someone told me that the reason we aren't being charged for the 30th anniversary Sub is because we already paid for it back when we signed up. My Shipped this morning so I'm guessing this is true? I seem to fall under the 2/17 group for my Club Eternia Sub though since my card was charged but no shipping notice as of yet. That could be true–Fearless Photog was the first figure, so perhaps he was covered by the initial $20 for the sub? But then, are we getting the shipping for him for free? No, the initial $20 “authorization” should never have become a full-fledged “charge” and should have dropped off your credit card. Unless they did charge you way back when (check your statements), in which case watch that you don’t get charged again, in the present, for Photog. You should have been charged the $20 plus tax/shipping for Photog when you placed the initial order. I just checked my bank account and I have a charge of $31.21 from October which matches the sub invoice email I have from when I placed the order. So if you have a 30th sub you should NOT see a charge for Photog. So,apparently some were authorized but not charged (which was how it was supposed to work) while others were authorized AND charged. Why is this not even mildly surprising coming from Digital River? No it has always been with the sub that you pay for the exclusive sub figure (Wun-dar, Shadow Weaver etc) when you sign up. When you signed up for the 30th sub that sign up cost was for the first figure. 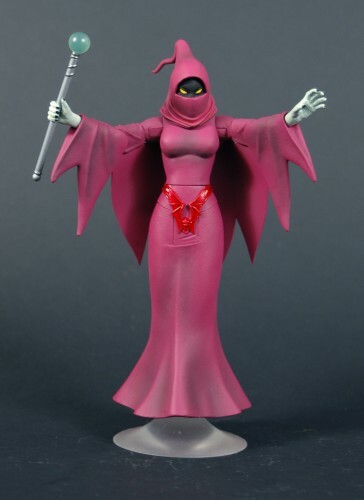 What you are thinking of is the authorization for the first figure of the Club Eternia sub, January's figure, which was authorized at the time of sign up but not charged until it was ready to ship. Think of it this way. For the Club Eternia sub you pay $20 plus shipping/tax for the exclusive figure when you sign up. For the 30th sub you paid for the first figure which happens to be Photog when you signed up. It's confusing because the 30th sub doesn't have an "exclusive" figure but they had to charge for something to initiate the subscription so it was the first figure. •When you purchase a membership, your credit card will be pre-authorized for $20, which is the cost of the first month’s figure plus the estimated shipping/taxes/fees. Pre-authorization means that the money is reserved from your available credit card balance. This pre-authorization amount is only for credit card validation and should be released in a few days (length of time depends upon your bank). You will not be charged for the first figure until it ships in 2012. For more information about pre-authorizations, please visit the Shop FAQs. I understand you are talking about the 30th sub, but I am telling you that I was not charged when I purchased the sub in September. I had a pre-authorization that dropped off. I have looked at three months of statements, and cross-referenced every Digital River charge, so I am absolutely sure of this. I only just today was charged for Photog (or, rather, got another pre-authorization that I assume will be verified and become an official charge since I got a shipping notice for him last night). "•When you purchase a membership, your credit card will be pre-authorized for $20, which is the cost of the first month’s figure plus the estimated shipping/taxes/fees. Pre-authorization means that the money is reserved from your available credit card balance. This pre-authorization amount is only for credit card validation and should be released in a few days (length of time depends upon your bank). You will not be charged for the first figure until it ships in 2012. For more information about pre-authorizations, please visit the Shop FAQs."